Cricket writer Andrew Ramsey’s job was to be on tour with the world’s greatest cricket team over a decade when it had no peer. THE WRONG LINE chronicles the privileges and pitfalls of a life spent trotting the globe, hanging out with sports stars, and being paid to watch cricket – an occupation regarded by countless cricket and travel fans alike as ‘the world’s best job’, even when it renders you alone and in peril with only a three-thumbed taxi driver for support. Set within the players’ dressing room and on the team bus; at the bar, the breakfast table, and even in a haunted medieval castle; in England, the West Indies and India, as well as Sharjah, Bangladesh, Kenya and Hong Kong – THE WRONG LINE gives you a ringside seat at some of the most memorable cricket events, including the remarkable 1999 World Cup and Australia’s chaotic 2005 Ashes campaign. 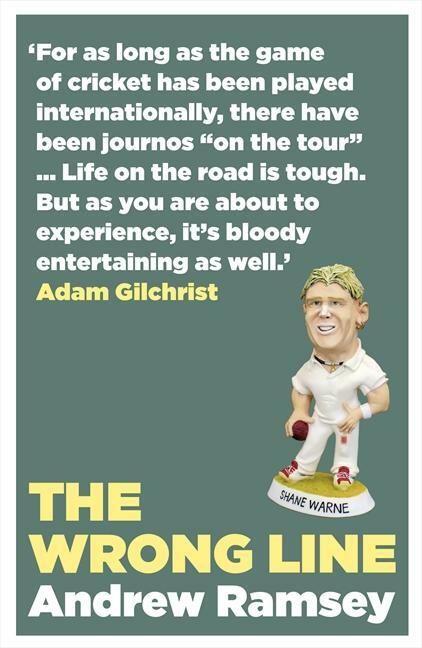 A tour diary unlike any you have ever read, it delivers a rare insight into the off-field life, character and thoughts of some of the game’s all-time greats, including Stephen Waugh, Shane Warne, Ricky Ponting, Glenn McGrath, Adam Gilchrist and Brian Lara.